Recently released 2 powerful responsive Blogger store theme (1) powered by Bootstrap 3 - mobile first web framework, (2) Facebook inspired design, discount code add-on & plug-ins included, both with mouse/touch swipe product image slider, shopping cart pre-installed, send order e-mail & Paypal checkout. Optimised conversion ready Blogger templates, on-line store build made easy for blog users & shopping made fun for users. Responsive image pop over now available for FREE download or for PRO versions with loads of e-commerce functionalities included. 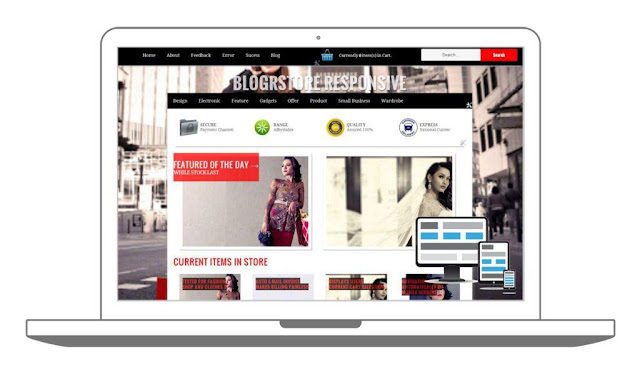 View details for this awesome Blogger store themes below. This article was initially published on April 6th, 2013 and currently updated on August 23rd, 2014 & 20th December 2014 with more shopping cart pre-installed Blogger themes/templates added to the collection. Made free for download, with full tutorial included/provided. All links to demo and blogger template source codes downloads are regularly check to ease on users use. 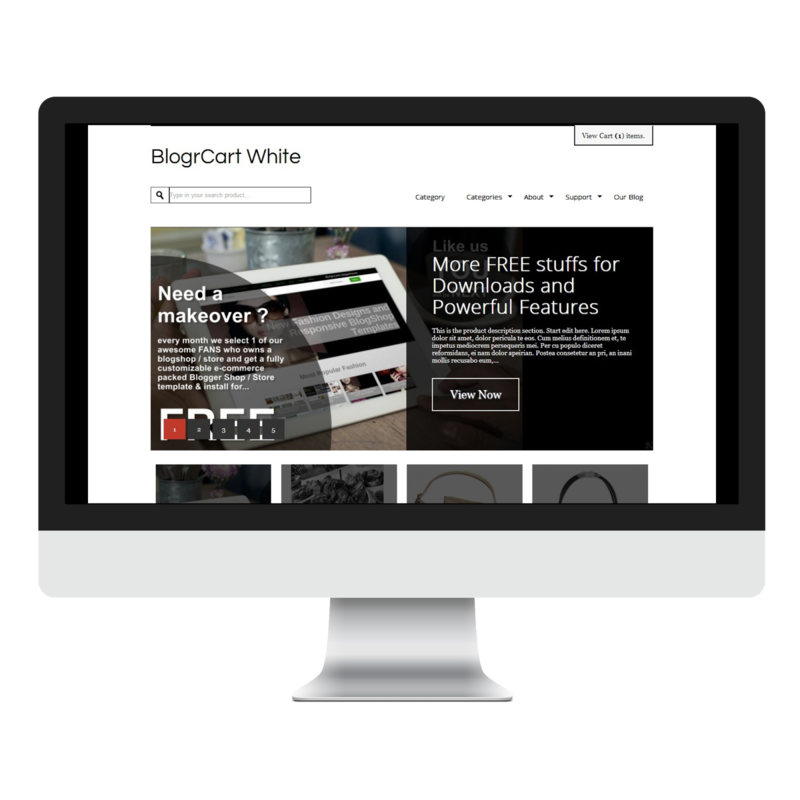 New Blogger template releases for 2014 with shopping cart e-commerce features made free for download with tutorial and how to install custom Blogger template included. 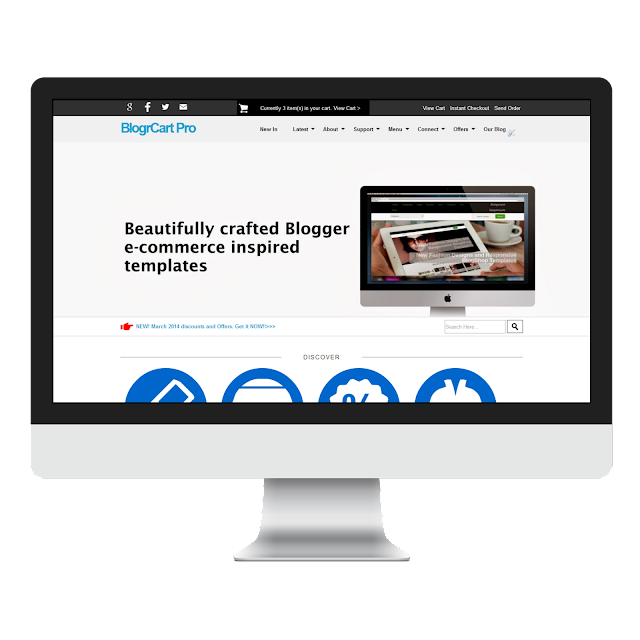 Customize your Blogger blog template and develop a one of a kind e-commerce ready store in minutes! Comes ready with auto post template for Blogger to easily edit your products in Blogger editor. Equipped with shopping cart details, product description, product pricing, add to cart button with cool pre-installed styling. 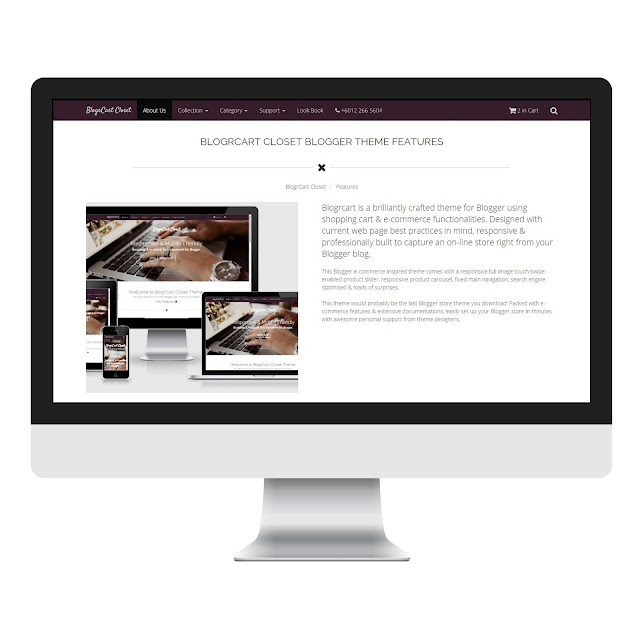 Publish your product with ease using the built-in auto post template designed for ALL of our shopping cart powered Blogger template. Available themes and templates for downloads. A collection of new and upgraded templates, search engine friendly, lightweight, premium featured, responsive or standard XML themes with live Demo, Tutorials and Downloads. Note: Certain download and tutorial links is either updating or still under progress. We will inform from time to time availability through our up and coming posts/articles. Further strict live working tests at our client's friends blog store and evaluation is still ongoing. PRO - Full license & permissions to use & abuse. Attribution removed. Shopping cart ready / add to cart button, pop over view cart. Unlimited send order invoice e-mail & Paypal checkout pre-installed. Pre-installed responsive product image zoom with image gallery toggle. Sticky header main navigation, responsive with drop down links available. Re-directs to a custom thank you & send error pages. Customisable email body text pre-included in template. Search engine and blogger template best practice with readable source codes. No hidden codes, No complicated HTML. Optimised JavaSscripts/jquery plug-ins and uses Content Delivery Network (CDN's) to feed plug-in libraries. Related product image carousel pre-installed. Uses Blogger default widgets & available in Blogger Layout. 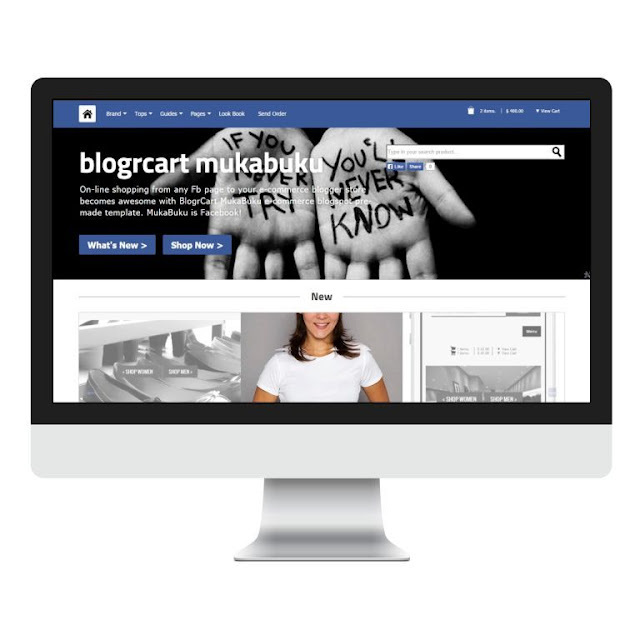 Responsive HTML5/CSS3, fully responsive Facebook inspired Blogger store theme. Shopping cart ready / add to cart button, responsive image zoom & works in all screen sizes. Facebook plug-in pre-installed includes Like, Recommends, Fb Comments, Face-pile widget, Share button with Facebook Developer API integration. Parallax homepage image header background. Alert helper for add to cart, checkout & more. Discount code add-on pre-installed (PRO) - Reward your customer easily with discount codes. PRO - Full license & permissions to use & abuse. Responsive HTML5/CSS3, lightweight, minimalist styled Blogger e-commerce inspired template. Shopping cart ready / add to cart button installed with view cart sliding features. Custom homepage with responsive image slider & click to action buttons, New product image section and optimised store text section. Mobile navigations pre-installed and tested with major modern web browsers. Re-direct to a custom thank you and send error pages. Customize email body text pre-included in template. Pre-installed product tagging on product posts ie New, Offer, Sold. Very lightweight, responsive, minimalist styled Blogger e-commerce inspired template for ease of styling. Auto homepage product image slider with title and caption for newly published products. Search engine and blogger template best practice with readable source codes. DUal checkout option with Paypal and E-mail order. Customize pages and view cart ready. Cool social share icons/buttons, sharing products made easy just from your site. Add to cart ready pre-installed with custom view cart page. E-mail invoice checkout unlimited sending product orders in a flash. Re-direct thank you and send error pages can easily be customized. Search engine template best practice. Customize email invoice body via template source codes! Various click to action and About Us section on every page. Feature Products and Offer Products display and customizable. Re-direct thank you and send error pages. Fixed responsive background image pre-installed and ready for inclusion. Good structural and readable codes with indicators. Top navigation and secondary navigations bar using default blogger widget. Version 1.0 / March 2013 - NEW! NEW! Installed lightweight jquery automated recent post product slider with title and description. Very quick page load. Wordpress styled Tabs sidebar widgets. Checkout redirect to your custom form. Main navigation with Link List Widget. Fixed background image pre-installed and ready for inclusion. Shopping Cart / Checkout / Tab style with show and hide selected product. Drop down manual update widget links navigation w/ tutorial. Full page width lightweight slider with caption. NEW - Added recent product page slider with customization pre-installed. Buttons and forms styles included. Clean code, structure and best practices. Lightweight current product post slider with auto title captions. Tested authorship and breadcrumbs results. Main navigation uses Link List widget. Search bar and e-mail subscription styles included. CSS browser safe rich colored gradients.